One of the major ideologues of abstractionism. From realistic landscapes, the artist gradually moved to geometric abstraction. 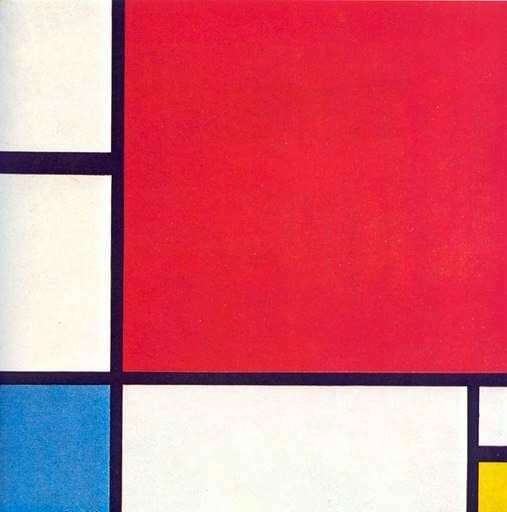 Mondrian initially tried to use monochromatic color gamut in his paintings. He believed that only such a method would be able to objectively convey the harmonious fundamental principle of everything. It is noteworthy that in addition to directly artistic compositions, Mondrian substantiated his point of view on the trends of geometric abstraction in theoretical works. According to the artist, only ideal geometric forms can convey perfect harmony. The straight line and the right angle are the primary elements used by the artist. In creating compositions the master uses three primary colors, and also uses shades of black and white. The painting of Mondrian is a whole world outlook, where a new art helps to comprehend the highest communication with the world. “Composition with red, yellow and blue” created in the style of “neoplasticism” and is considered one of the best works of the author. The combination of straight lines and color inserts, built by the artist according to one principle known to him, creates a feeling of timeless space. About 70 works performed in this style, where the dominant place belongs to the correctness of the lines and the equilibrium combination of colors. Pictures – “lattices” are created for 20 years. The canvases of this series have no personal names. They are assigned serial numbers. Thus, the artist emphasizes detachment and the desire for orderliness at different levels of perception.